Based on extensive surveys of over 50,000 US churches, this guide faces the fact of declining church traction in communities, and looks at ways that effective change can be brought about. Rainer's approach matches cutting edge methods with core biblical doctrinal commitment. 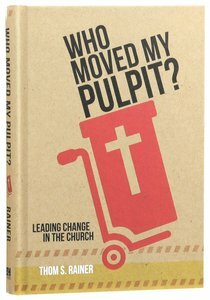 About "Who Moved My Pulpit? Leading Change in the Church"
Nine out of ten churches in America are either declining or growing slower than the community in which they are located. Stated simply, 90 percent of American churches are losing ground in their communities. Change is not an option; it is an urgent need. We don't change our doctrines and biblical foundations, but we do change our methodologies and approaches for this rapidly changing culture. Based on the studies, consultations, and research of over 50,000 churches, best-selling author, Thom S. Rainer, shares how effective change has taken place in many churches. While it is not a formulaic approach, Who Moved My Pulpit? is a clear guide for church leaders who are not satisfied with the status quo, and who yearn for their churches and ministries to make a kingdom difference. True transformational change in the church is possible.